America’s farms grow the crops that feed, clothe, and fuel the country. The agricultural industry has an undeniable economic and strategic importance and must rely on innovation to maintain its competitiveness. Precision agriculture and agricultural robotics are important trends that promise to revolutionize farming practices. Federal and state governments offer significant tax incentives designed to support emerging technologies that optimize yield and profitability. Over the last century, U.S. agriculture went through major transformations. In the early 1900s it was a labor intensive industry, encompassing numerous small and diversified farms. Due to major technological advances, the industry has a reduced number of large, specialized farms. Despite changes in configuration, the agricultural sector remains key to the national economy. So much so that incentivizing young farmers has been considered a government priority. In an effort to replace aging operators that prepare to retire, U.S. Agriculture Secretary Tom Vilsack established the goal of creating 100,000 new farmers over the next years. Data from the United States Department of Agriculture (USDA) shed light on the economic importance of the agricultural industry. In 2013, U.S. agriculture and agriculture-related industries generated $789 billion, representing a 4.7 percent share of the country’s GDP. In the same year, 9.2 percent of U.S. employment was related to agriculture, a total of 16.9 million jobs. Farming activities contributed $166.9 billion to the overall output and generated 2.6 million jobs. America’s agricultural exports have gained strength and outpaced imports in 2014, generating a trade surplus of $38.8 billion. 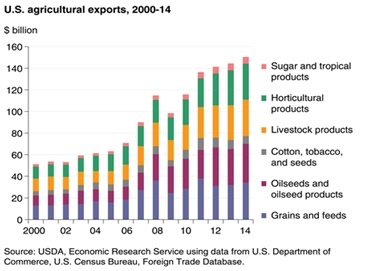 Higher demand from developing countries, especially China, as well as rising commodity prices have doubled the value of U.S. agricultural exports between 2006 and 2014. Wheat, soybeans, cotton, corn, and their processed products have played a central role in this recent trend. food to maintain a healthy and active life”. 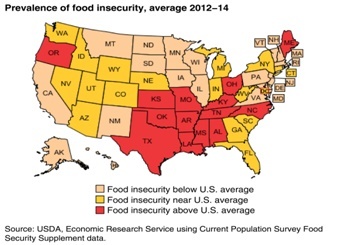 In 2014, 14 percent of American households were food insecure at some point during the year. 5.6 percent of them, or 6.9 million households, experienced very low food security, meaning not only access to adequate food was limited but there was reduced food intake and disrupted eating patterns by one or more of its members. In 2014, 19.2 percent of households with children were food insecure. From a global perspective, the issue of food security is even more critical. According to the Food and Agriculture Organization, between 2011 and 2013, there were 842 million people, or one in eight people, who suffered from chronic hunger, regularly not getting enough food to conduct an active life. According to the United Nations, the world population is expected to reach 9.6 billion by 2050. In order to meet this unprecedented demand, global food production will have to increase by 60 percent, in relation to 2005/07 levels. Climate change, water scarcity, and workforce and land availability pose major challenges, putting the agricultural industry under great pressure. Additional strain comes from the growing demand for sustainable practices in the agricultural sector. Recent data show that agricultural activities occupy 40 percent of the world’s land surface, use 70 percent of freshwater withdrawals, cause 15 percent of world greenhouse emissions, and constitute the largest source of water pollution. Innovation is the only way to make sure the agricultural industry will fulfill future demand while ensuring sustainability and cost-effectiveness. Technological advances have been the main drivers of U.S. agricultural strength. Innovation has enabled tremendous gains in productivity – according to Monsanto, an agrochemical and agricultural biotech company, in order to match the amount of food grown today, farmers from 50 years ago would need their fields to cover the entire country. The most recent trend in agricultural innovation is precision agriculture. Based on cutting-edge data collection technologies, it enables farmers to use predictive analytics to optimize yield and overcome operating deficiencies. The variable-rate application of agricultural inputs, such as water, seed, fertilizers, and pesticides, is an interesting example of how precision techniques can reduce costs and increase productivity. The use of sensor and location technologies help farmers determine the exact needs of each area, allowing them to make smart decisions that take into consideration field variability. A recent report by Markets and Markets points out that precision farming “cuts down input costs, fuel usage, and labor, and negate the environmental impact”. The same report forecasts that the total precision farming market size will grow at a CAGR of 12.2 percent from 2014 to 2020, reaching $4.55 billion by 2020. Precision agriculture goes hand-in-hand with another important trend, namely, agricultural robotics and automation. The following sections will cover emerging technologies from both areas of innovation, all of which can benefit from R&D tax incentives. With the ability to provide actionable imagery on every crop acre in the country, satellites have become strategic tools for optimizing agricultural management. Common satellite applications include 1) creating field-management zones for site-specific management; 2) monitoring plant health for in-season, site-specific nutrient prescription maps; 3) crop scouting for targeted fertilizer and herbicide applications; 4) post-disaster damage assessment; 5) topographic mapping for site-specific management and drainage assessment; and 6) database development for field trials and on-farm research. Based in Tomball, TX, SCI provides satellite image data at different spatial, spectral, and temporal resolutions for crop assessment, crop health, change detection, environmental and soil analysis, irrigated landscape mapping, yield determination. The company utilizes AgroWatch, a suite of value-added information products that help farmers, growers, consultants, and other decision makers quantify crop status, soil conditions, and rates of crop change throughout the field. AgroWatch products can reduce field time almost in half by identifying problems before they are visible to the naked eye. The innovative solution quantitatively compares current images with previous ones in order to inform both short and long term management decisions. Founded in 2008, NST is an agriculture-directed company with R&D and processing centers in U.S. and Eastern Europe. It is the creator of Cropio, a field management system based on satellite crop-monitoring technology. Using satellite images with different spectral ranges, the system provides real-time updates on crop conditions, including vegetation levels and problem areas. In addition to field monitoring and zoning, it offers a variety of field analytics capabilities as well the ability to design fertilizer distribution maps and to compose individual recommendations regarding the amount of nitrogen needed. With mobile applications for both iOS and Android, the innovative system notifies the user as soon as any important changes are detected. Soil, crop, and weather sensing technologies have been major drivers of agricultural efficiency. They give farmers unprecedented access to information on factors affecting the production. Sensor-based monitoring is key to creating resistant, highly productive crops. Innovative sensor networks provide real-time feedback on crop and site variables. Modeling software then use this data to determine the optimal amounts of agricultural inputs in specific locations and time, including water pressure, fertilizer and pesticide dispersal, heating and cooling, as well as sunlight and shading. Headquartered in Sunnyvale, CA, Trimble offers an array of precision farming solutions. When it comes to sensors, the company offers two different versions of the GreenSeeker. The first one is a crop vigor mapping system that uses optical sensors and complex agronomic calculations to perform real-time verifications of the amount of nitrogen available in the soil. This information is subsequently used to determine the optimum fertilizer prescription for each area, incorporating field variability in order to apply the right amount in the right place, at the right time. The second solution is a handheld version of the GreenSeeker which carries optical sensors that emit brief bursts of red and infrared light, and then measures the amount of each type of light that is reflected back at the sensor. GreenSeeker handheld can be used in combination with Trimble’s Connected Farm Scout application far smartphones and tablets, which enables users to geo-reference the targeted location. Sensors can also be used to improve the performance of agricultural equipment. Sycamore, Illinois-based Dawn Equipment is the creator of the X-Sense Down Pressure Sensor, a direct replacement for the standard depth-adjustment mechanism on John Deere planters. Traditional gauge wheel load sensors often register incorrect down force readings due to their inability to filter the movement of connecting components on the planter row unit. Dawn’s innovative sensors, on the contrary, isolate competing mechanical vibrations and noise thus allowing for much more accurate adjustments. According to Dawn President Joe Basset, the goal of the automatic down pressure solution is to run the lowest possible gauge wheel load while never planting shallow. In August 2015, the Federal Aviation Administration announced it had approved more than 1,000 applications for commercial drones under the so-called “Section 333 exemptions”. The agency’s current rate of 50 approvals per week is a major increase, given that only about a dozen companies were cleared to operate drones in the beginning of 2015. A 2013 report by the Association for Unmanned Vehicle Systems International (AUVSI) estimates that the first decade of commercial drone integration in the U.S. will generate around $82 billion in economic impacts. The agricultural industry has a lot to gain from drone technology. Used as strategic surveillance tools, unmanned aerial vehicles (UAV) can help increase crop yields while reducing the costs of scouting the fields. In addition to monitoring for diseases, drone’s spectral imaging enables a more targeted use of fertilizers, water, and labor. Some even believe that the use of drones will make food taste better. Even though prospects are very positive, a full integration of drone technology depends on the progress of federal and state regulations. Farmers should look for vendors that are both compliant with existing legislation and capable of upgrading operating software to meet pending location control applications. Headquartered in Raleigh, NC, UAV manufacturer Precision Hawk provides end-to-end solutions for aerial data gathering, processing, and analysis. In addition to carrying a variety of sensors (visual, multispectral, thermal, etc. ), the company’s vehicles are equipped with proprietary artificial intelligence that enables in-the-air flight path calculations. Precision Hawks’ sophisticated algorithms are at the basis of a variety of groundbreaking drone applications, such as 3D terrain mapping, plant height and density measurement, weed detection, crop health indexes, among others. The company has recently entered a Cooperative Research and Development Agreement with the Federal Aviation Administration to advance the research around UAVs across rural areas. Based in Johnston, IA, AgPixel gathers a team of remote sensing and geospatial analysis experts that assist agricultural producers using UAV. The company’s crop health assessment products are designed to interpret and visualize data collected by drones. AgPixel’s solutions detect and analyze differential reflectance of visible and near-infrared light from plant leaves, which becomes the basis for georectified, actionable maps. Plant density, disease detection, stand counts, classification, and quantification are a few examples of custom map products available. Once considered completely different worlds, farming and IT have become inseparable. Farm management and data analytics applications are now indispensable tools to guaranteeing efficiency and competitiveness of agricultural operations. 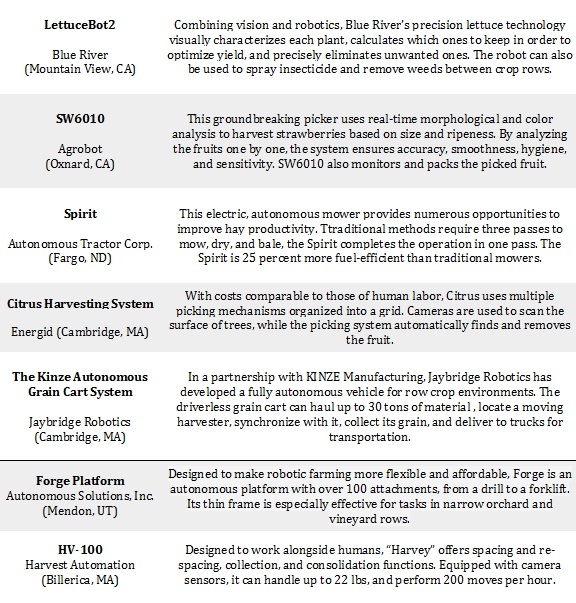 The following companies leverage technology to give farmers the insights they need to make better business decisions. Based in Minneapolis, MN, Conservis provides farm management software to help farmers track field activities, manage inventories, and analyze yields. Conservis’ platform is specifically tailored for each farmer’s workflow. It provides real-time management capabilities and allows users to integrate different functions of their businesses, aggregating data, and using analytical functions to support decisions. The company recently partnered with Santa Ana, California-based Iteris, Inc. to incorporate decision support analytics into the Conservis platform. Iteris’ ClearAg is a groundbreaking solution that combines global, multi-sensor weather analyses, ensemble-based weather forecasting, customized soil modeling, and a staff of expert meteorologists. Used on a third of U.S. farms, Ann Arbor, MI based FarmLogs helps farmers “quantify the variability on their fields” and make better-informed management decisions. In addition to monitoring crop health, the platform features an integrated planning tool and an inventory management tool with complete transaction history. Using the FarmLogs application, farms can receive data that is remotely gathered by sensor and satellite technology, such as rainfall and heat accumulation. FarmLogs recently unveiled an innovative device that facilitates data upload by plugging directly into and automatically feeding the information gathered into the platform. The company also launched an innovative monitoring system that alerts farmers the exact part of the field that needs attention by comparing real-time satellite images with those from the last five years. Headquartered in Duluth, GA, agricultural equipment manufacturer AGCO has created an innovative solution to help farmers collect and use data. Their idea is to seamlessly connect the entire crop through total farm data management. This is made possible by an array of tools including guidance, telematics, and advanced sensors that create smart, connected machines that can communicate with farm managers, third party service providers, and each other. AGCO is partnering with different vendors of farm management software to make sure farmers have ample choices. Their partnership with DuPont Pioneer enables users to wirelessly transfer the information collected through AGCO’s equipment to Pioneer’s Encirca software. Agriculture is undoubtedly one of the sectors in which the impact of weather conditions is the most evident. In addition to determining how crops grow, the climate also affects the logistics around harvesting and transportation. Thus, reliable weather forecast is key to maximizing yields and enhancing productivity. Predictive weather analytics has recently attracted unprecedented attention and investments. IBM recently announced the acquisition of the digital businesses, intellectual property, infrastructure, and data assets of Weather Co., best known for being the owner of the Weather Channel. The $2 billion deal focused on the company’s forecasting group, Weather Services International (WSI). WSI is said to generate over 10 billion weather forecasts a day. IBM is not new to the world of weather analytics. In 1997, the company launched the “Deep Thunder” project, which led to the creation of a hyper-local weather-modeling service that uses big data analysis. The Deep Thunder system uses temperature and moisture data from on-site sensors, data from the National Oceanic and Atmospheric Administration, the national Aeronautics and Space Administration, and the U.S. Geological Survey, and processes on a supercomputer to create a weather model. Deep Thunder's accuracy is within a mile and can predict weather conditions up to three days in advance. Monsanto acquired this San Francisco, CA based startup in 2013 for $930 million. The acquisition was a strategic move for the agricultural giant who considers data science to be the industry’s next major growth frontier, representing a $20 billion revenue opportunity. The Climate Corporation, now a division of Monsanto, is the creator of the Climate FieldView Platform, a combination of hyper-local weather monitoring, agronomic modeling, and high-resolution weather simulations that deliver online and mobile solutions designed to help farmers enhance productivity through data-driven decision making. By 2025, an estimated 1.8 billion people will live in areas plagued by water scarcity, with at least half of the world's population living in “water-stressed” regions. Responsible for 70 percent of all freshwater withdrawals in the globe, the agricultural sector is directly affected by the ongoing water crisis. According to the University of California, Davis, the drought inflicted $1.5 billion in agricultural losses in 2014 alone. Precision agriculture technologies promise to help farmers manage, control, and optimize water usage as a means to adapt to decreasing water supply. According to the Environmental Protection Agency (EPA), potential savings from more efficient irrigation techniques are substantial; “we could save $435 million in water costs and 120 billion gallons of water across the country annually from not overwatering lawns and landscapes”. Data collected through sensor technology can help farmers better manage their irrigation. John Deere’s Field Connect sensor system, for instance, can be used to map how water moves through the soil. The soil moisture profile shows farmers the exact amount of water that is deep into the soil. Though traditional pivots often place water on the surface, they do not necessarily get moisture where it needs to be. Sensor systems allow users to assess the effectiveness of their pivots and monitor their water use. The use of recycled water for irrigation is a valuable strategy to help farmers overcome water shortage. Netafim, an Israeli provider of smart irrigation solutions, is a leader in treated wastewater usage for drip irrigation. The company developed the Bioline subsurface dripline for wastewater drip dispersal applications. The innovative system releases recycled water below the ground, preventing the surfacing of effluents, restricting potential contaminations, and avoiding unwanted odors. Netafim also provides the filters, valves, air vents, and flow meters necessary for wastewater treatment. The company argues that using treated wastewater for crop cultivation not only ensures food security but also brings agronomic and environmental advantages since recycled water carries nutrients and organic matter that benefit the soil. According to a 2012 study by the California Farm Bureau, 71 percent of labor-intensive specialty crops suffered from labor shortage and 20 percent were unable to finish their harvest. In this scenario of workforce scarcity, the agricultural industry is turning towards robotics. Automated harvesting and packaging solutions can be the source of major productivity gains. The ability to harvest at all hours as well as to cover more ground in less time can be a game changer in labor-intensive farms, such as those growing fruit and vegetables. Using robotic automation is particularly important for farmers struggling with drought as robots can offset the higher costs of irrigation. In addition to robotic pickers and packers, autonomous ground vehicles (AGV) have gained increasing attention. With a wide variety of applications, such as fertilizing, seeding, weed removing, and crop spraying, these robotic systems deliver unprecedented accuracy. Besides cutting labor costs, higher speeds and reduced overlaps enable savings in fuel, seed, and chemicals. Recent developments in AGV technology include navigation systems for autonomous tractors. Created by Autonomous Tractor Corporation (ATC), the AutoDrive is an interesting example which relies on a proprietary Laser-Radio Navigation System (LRNS) for sub-inch positioning data and uses artificial intelligence to allow farmers to “train” the tractor - no programming skills necessary. Machine vision systems are a key element in many of the farming automation solutions currently available. Generally used for navigation and targeting, imaging techniques vary, however, according to the specific task to be performed. In fruit picking, for example, color is one of the most important aspects to be considered as it indicates the degree of ripeness. 3D vision is also necessary to help determine the fruit’s exact size and position. Equipped with cutting-edge technology, farmers are reinventing the world’s oldest industry. Sensors, satellite imagery, drones, and robots are just a few examples of innovative tools that can optimize farm operations while reducing costs and environmental impacts. Federal and state R&D tax credits are available for those investing in precision farming and agricultural automation activities.